A Coast Guard rescue swimmer from Coast Guard Air Station San Francisco transfers two people from a cave at Mussel Rock, Calif., where they were stranded, to emergency medical services personnel from San Mateo Fire Department, Sept. 11, 2017. 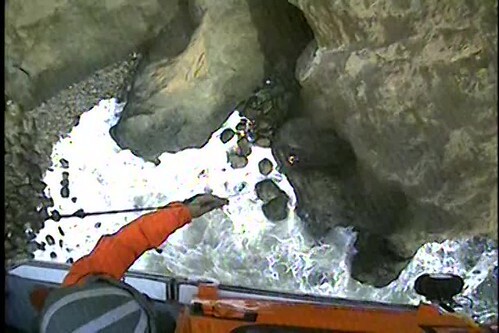 SAN FRANCISCO — A Coast Guard helicopter crew rescued two people stranded in a cave at Mussel Rock, Monday afternoon. Coast Guard Sector San Francisco watchstanders received a 911 relay call at approximately 2:50 p.m., with a report that a man and a woman were stranded in a cave due to high tide and that the woman was suffering from a leg injury. An MH-65 Dolphin helicopter crew from Coast Guard Air Station San Francisco arrived on scene, hoisted the two people over to San Mateo Fire Department emergency medical services personnel on shore at 3:50 p.m. The people reported the cave was accessible by foot during low tide, but due to the woman’s injury, they were unable to make it back before high tide came in.